• Marinate Chicken In Yogurt, Ginger Paste, Garlic Paste And Salt For An Hour.Heat Ghee In A Thick-Bottomed Pan. Add Cumin Seeds. Stir-Fry For Ten Seconds. Add Cloves, Cinnamon Sticks, Green Cardamoms And Bay Leaves. • Stir-Fry Again For About Ten Seconds. Add Sliced Onions And Saute Till Golden Brown. Add Chopped Tomatoes And Cook On High Heat For Three Minutes, Stirring Continuously. Add Red Chilli Powder And Stir. Add Chicken Along With The Marinade And Saute Till The Chicken Is Half Cooked. • Add Chicken Stock And Bring To A Boil. Stir In Rice And Bring To A Boil. Reduce Heat And Cook Till The Water Level Reaches The Rice Level. 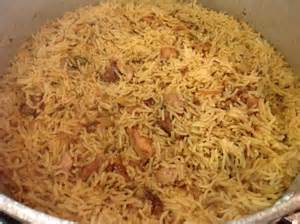 • Cover The Rice With A Lid And Cook On Low Heat For Twenty Minutes Or Till Rice And Chicken Are Fully Cooked. Remove The Lid And Stir Lightly So As To Separate The Rice. Serve With Raita And Kachumber.